Admire the unique beauty of Martinique, discover the underwater wonders on a snorkeling adventure. Test an healthy and gourmet meal with fresh drinks. A day out of time dedicated to the awakening of the senses. If a date is not available; or if you have any questions, contact us! Enjoy a sail along Martinique stunning coastline with Madisail. With our discovery sailing day tour, embark on a legendary multihull boat and relax for an all-inclusive experience. You could learn how to sail or just relax and enjoy. Meet at 9:15 am at the pontoon of the La Batelière Hotel, behind the Lili’s Bar Restaurant and the La Batelière Dive center. 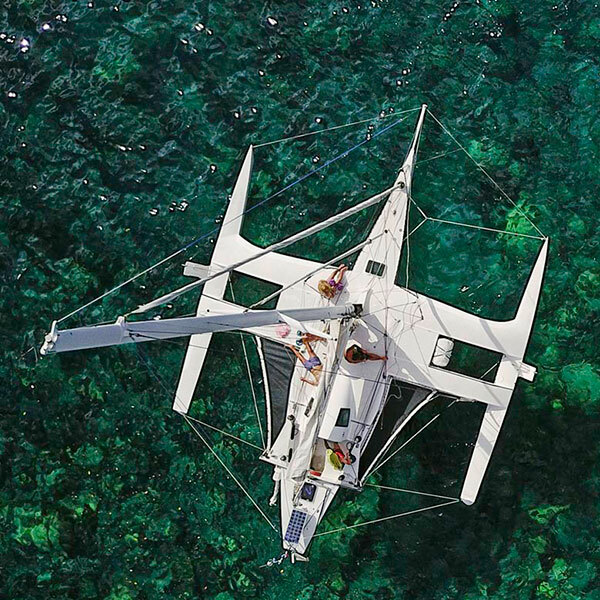 You will embark with your skipper Pol on our dinghy to go onboard of the trimaran. After a short safety brief and introduction to the yacht, it’s time to hoist the sails! Everyone can be envolved as they want to getting the yacht sailing, using the winch and take the helmet. If you prefer, you could also be quiet, listening the wind and the waves. It’s time finding our secret spot, put the anchor and go with Pol on a marvelous snorkeling experience. We will give you all the material you need, and Pol with provide all the advices you need in order to live the perfect moment wich feet with your level, and your expectation. If you’ve never put your head underwater, he’ll help you discover equipment ( mask, snorkel and fins ). If you are a good diver, he could teach you some freediving tips, or yoga diving ( his invention ). After this fantastic snorkeling adventure, it’s time to drink and eat. You decide if you want to test the alcohol or virgin version of fresh cocktail prepared by Jess. After, there is a local, fresh and simple meal. Don’t hesitate to ask vegan version ! After of a free time in the secret spot, it’s time to go for the afternoon sailing time. Around 4:30 you will be back at hotel La Bateliere in order to prepare your night in Martinique. If you drink only mineral water, take some because we provide only tap water.